Xtential Corporation founded in 2002 in New York City, was a leading interactive agency focused on enabling business-to-consumer and business-to-business Web-based marketing and communications with a strong ROI. Xtential's commitment to customer service was the difference that had attracted many high-profile clients. By integrating marketing and communications expertise and advanced software applications development, Xtential offered tremendously useful and memorable Internet solutions ranging from concept development and design execution to multimedia production and world-class programming. Xtential Corporation has provided its services to several major clients, among which were LG Electronics, American Advertising Federation, American Express, as well as about a dozen of smaller clients. 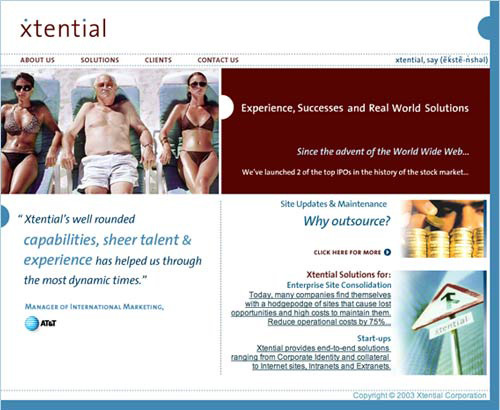 Xtential Corporation has ceased operations in 2007 as a part of the corporate transitioning from the Web marketing business in to the software development field. Disclaimer: Consulting Land is not associated in any way with the above corporation, or with the owners or officers of the above corporation.